Part I of the Watson's thriller had me speeding through it, it was such a unique concept; a woman wakes up in a strange bed with a strange man; a strange man who is a good deal older and married to boot. The woman has no idea how she ended up here; she tells us she must have been really wasted. "Wasted enough to have gone home with a man with a wedding ring and hairs on his back." The woman who has no idea where she is, is Christine; she had an accident years ago which robbed her of her memory, her very identity, and now every day begins the same. She wakes up; she's lost and confused; her husband, Ben, patiently calms her down and sets her straight. Gives her a large tatty plastic-covered scrapbook; explains who she is, who he is, and what he feels she needs to know. Tells her she has a cell phone in her purse and in no time at all Ben goes off to work leaving Christine home alone. On this day, the day we meet Christine, she receives a call on this cell phone; it's a man, her shrink, and he wants to meet with her. They've been working on her memory he tells her; she's been keeping a journal and he wants to return it to her. It could help bring her memories back. Some of these memories we begin to suspect, may not be so pretty. Part I comes breathlessly to a close and Part II The Journal of Christine Lucas begin with the big questions of who to trust; her husband, her doctor or herself and her fragile hold on her memories; running through the narrative in the memoir again and again. That's it really, right there. 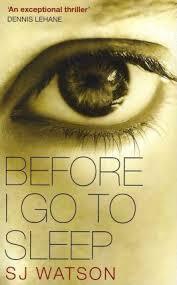 Christine's loss of memory equals not just loss of trust but loss of self; a nightmarish prospect. I try to imagine waking up each day not knowing whether that's my own husband beside me, I'm sure I am frantic with fright because I have no idea who he is. More importantly I don't really know who I am. My notions about myself don't fit with reality. I feel young inside (I do) but I can see the wrinkles belong to me (I can). How the f$%#! did that happen? I have no bleeping idea; I just know that it's frightening, truly horrifying how fast time flies, how our lives once lived, are relegated to memory and if we lose those memories, we have nothing? I'd be confused and scared. Would I be screaming or, like Christine, would I try to keep my fears tamped down? And just when I have wrapped my head around the fact that the last 20 years of my life have gone missing, my mysterious cell phone rings from the depths of my bag and I answer it to hear a man tell me he is my doctor and that I will understand all when I've finished reading my journal which I've hidden, he tells me, in a shoe box in my closet? That is a pretty mind-blowing AND mind-numbing way to live. The unraveling of the mystery of the missing pieces of Christine's memory via the journal is mostly page turning stuff. Like Christine we don't know who to trust, the emerging versions of reality contradict each other and in this triangular tale - there are very few characters beyond the couple and the doctor - I found myself constantly second-guessing Christine's memories, the conclusions she draws from them as well as my own. It's a great device, that journal. Except that the journal is ultimately a couple of hundred pages long. Handwritten. Which is one of the books' major flaws or my stupid knit-pick, your choice. I don't see how Christine would be able to find her way through the massive written material AND arrive at a level of understanding everyday; the mental mountains seem impossible to scale. Forget the intellectual and emotional process; how would she have time to read it all? Is it odd that Christine's phone never goes dead, never needs charging? It's simply not dealt with. I could assume that the author doesn't bother to tell us about the charging of the phone because it's just a boring basic fact, taken for granted like all the meals eaten, beds made, laundry done. The minutiae of Christine's daily life. The real reason Watson skims by the care and feeding of the cell phone may be so as not to draw attention to it; if he addresses that, he has to answer other questions; big plot holey type questions such as doesn't Christine's husband notice the doctor has called? And especially, doesn't Christine's husband notice she has two cell phones? Ben would be very interested in that tidbit but Watson has to ignore those questions because the answers would bring things to a head sooner rather than later. And later is better for him - if a bit overlong for us, as there's quite a bit of repetition as Christine goes over and over the journal. For the most part I enjoyed the book. I was pretty sure I knew how it ended almost from the very beginning - it was the first of my three theories and I'm no genius - but I decided, much like we do over and over again at the movies to 'suspend disbelief' and enjoy the show, so to speak. Will it make a good movie? YES! The best. It's in the process right now, shooting as I noted in my post earlier this week, at Twickenham Studios and in and around London. 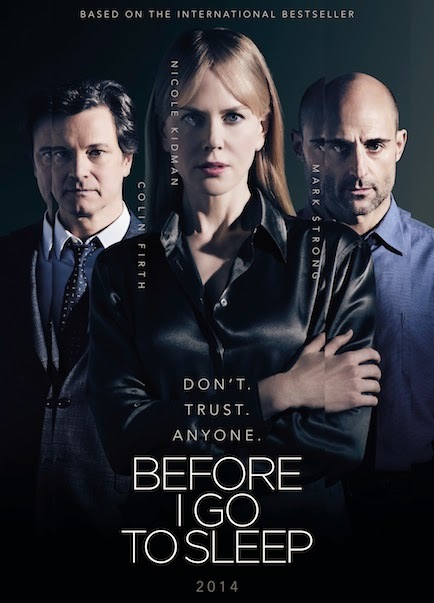 Nicole Kidman stars as Christine, Colin Firth as her husband Ben and Mark Strong as Dr. Nash. To go into details about just how well the casting of the men works would be to spoil the story. So I shan't. But I love the idea of Nicole Kidman as the hesitant Christine trying to figure it all out; including her exploration of the notion of the girl inside the older woman's body; a subject that Kidman herself is all too familiar with in an age when actors, especially those of the female variety, are subjected to constant inspection and criticism. 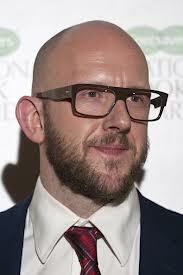 This will be writer/director Rowan Joffe's fourth time out as director; his lengthier screenplay resume includes adaptations of Graham Greens' Brighton Rock and Martin Booth's The American both of which he directed as well. It will be really exciting to see what Joffe has done with this one when the film is completed a year from now. Before I Go To Sleep is S.J. Watson's debut novel and received scads of great reviews and those perfectly penned blurbs esteemed writers are asked to provide by their publishers. Lionel Shriver who wrote the marvelous but deeply disturbing epistolary novel about a mass murderer, We Need to Talk About Kevin calls it 'a cracking good thriller' and the book left Dennis Lehane's nerves jangling for hours' after he finished the last page. As for me, I think Mr. Watson has a deft hand with creating tension and keeping that suspense up. In some ways this is an old fashioned whodunnit and while I had my strong suspicions Watson would often throw in something else that would lead me astray and keep me reading. What I think he did incredibly successfully was to capture Christine's voice so well that I assumed S.J. was a woman. Oops, it's Mr. Watson and he's currently working on book 2. Thanks for a thorough review, and without giving out spoilers. I agree with you that there are holes in the novel that impede my thorough enjoyment, basically, it's the journaling part. That's right, Christine might be amnesiac, that's why she needs to read over and over again what she'd already discovered the night before, but we readers are not. So we have to go through with her all the repetition in the bulk of the book. And yes, I'm looking forward to the movie, which, this time, I really wouldn't mind if the screenwriter changes the plot line or scenes to enhance the cinematic effects. I've totally enjoyed The American the movie, but not the book by Martin Booth (under another title). I hope Rowan Joffe can keep up the good work, esp. when he has such a top rate cast under his direction.